L. Nichols, a trans man, artist, engineer and father of two, was born in rural Louisiana, assigned female and raised by conservative Christians. 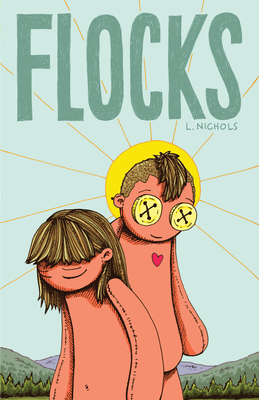 Flocks is his memoir of that childhood, and of his family, friends and community, the flocks of Flocks, that shaped and re-shaped him. L.'s irresistibly charming drawings demonstrate what makes Flocks so special: L.'s boundless empathy. L. Nichols was born and raised in rural southwest Louisiana and went on to earn a bachelor's degree in Mechanical Engineering and a master's degree in Media Arts and Sciences, both from MIT. L. has a unique voice that utilizes the language of science and engineering to add an additional layer of meaning and complexity to his work. Nichols also incorporates elements of comics to turn his paintings into broader narrative forms. L. lives and works as an illustrator, comic artist, graphic designer, educator and sometime blacksmith with his wife and their two children in New York's Hudson Valley. He has been published in over a dozen comics and art books.